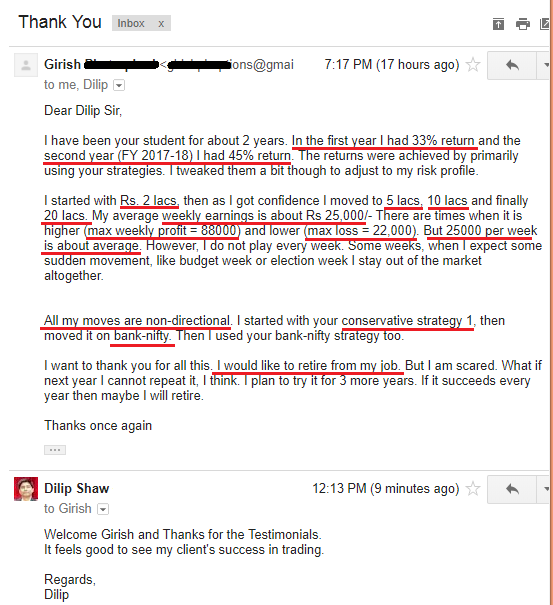 I keep getting a lot of testimonials every-week (I am unable to upload them all due to lack of time), but this is a special testimonial from one of my clients Girish (full name hidden due to privacy and on client’s request). He became my client in FY (2016-17). In FY (2016-17) his return was 33%, and in FY (2017-18) his return was 45%. Average comes to 2.75% per month in FY (2016-17) and improved to 3.75% per month in FY (2017-18). But more important than that is he is making an average of Rs.25,000/- per week which is an average of Rs.1 Lakh a month. Too good Girish. Keep it up and thanks for the testimonial. I have been your student for about 2 years. In the first year I had 33% return and the second year (FY 2017-18) I had 45% return. The returns were achieved by primarily using your strategies. I tweaked them a bit though to adjust to my risk profile. I started with Rs. 2 lacs, then as I got confidence I moved to 5 lacs, 10 lacs and finally 20 lacs. My average weekly earnings is about Rs 25,000/- There are times when it is higher (max weekly profit = 88000) and lower (max loss = 22,000). But 25000 per week is about average. However, I do not play every week. Some weeks, when I expect some sudden movement, like budget week or election week I stay out of the market altogether. All my moves are non-directional. I started with your conservative strategy 1, then moved it on bank-nifty. Then I used your bank-nifty strategy too. I want to thank you for all this. I would like to retire from my job. But I am scared. What if next year I cannot repeat it, I think. I plan to try it for 3 more years. If it succeeds every year then maybe I will retire. Read the last paragraph. I quite like his approach not to retire now but after 3 years, that is 2021. I guess he is of my age and will retire before 50 years and become a full time trader. Why I Liked His Plan to Retire After 3 Tears and Not Now? This comes under financial management. Though he is making 1 lakh a month he still wants to take time to take a final decision, which I am sure he will do. This is very well planned. Why This Comes Under Financial Management? Can you notice he is not hurrying the process to retire even after seeing money? And hey this is not a small money – its 1 lakh a month, still he needs time to decide. Compare this to a trader who makes money in first trade and assumes he is a genius and doubles or triples his trade size in the nest trade itself and losses double than what he made in his first trade. ANY FINANCIAL DECISION TAKEN IN A HURRY IS FINANCIAL SUICIDE. THINK AND ACT IN MATTERS OF FINANCE. Even though Girish can retire today as he is making by trading more then 90% of Indians per month and more than 99.99% of traders per month still he plans to retire after 3 years. He is not in a hurry. If you are losing money trading options or futures and trying to repeat the same thing again and again – you are simply not trading but gambling and taking financial decisions in a hurry that tomorrow I will recover all my losses. Even if you start making profits you cannot recover all your losses in one day. Give it time. But first learn strategies that will make you a monthly income like Girish is doing. If you enroll for the course email me the details so that I can start the course today.